New to the color picker in the Inspector is an Eyedropper tool that grabs the color from any pixel on the page. Select the current color by clicking or pressing Enter. Abort the operation by pressing Esc. Use the Up/Down keys to move by one pixel, and Shift-Up/Shift-Down to move by 10 pixels. 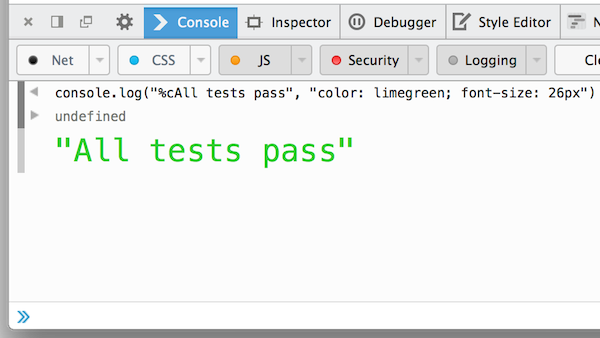 On parity with other browser developer tools, you can now add style to console logging with the %c directive. Multiple selection. Hold down Ctrl/Cmd while selecting to get multiple selections. Rectangle selection. Hold down Alt to select a column-aligned block of text. Undo selection. Undo the last selection action with Ctrl-U/Cmd-U and redo with Alt-U/Shift-Cmd-U. Sublime Text keybindings. To enable, go to about:config in the url bar and set devtools.editor.keymap to sublime. 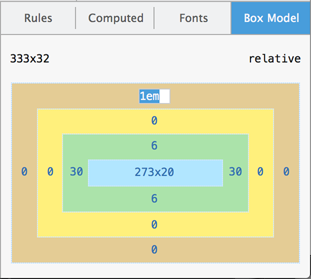 Debug animation frames in WebGL and 2d canvas contexts with the newly-landed canvas debugger. The canvas debugger is an experimental feature that has to be enabled in the setting panel. Multiple canvases are not yet supported (bug) as well as animations generated with setInterval (bug). The canvas debugger is described in more in this blog post. Firefox 31: Add-on Debugger from Jordan Santell on Vimeo. Special thanks to the 38 contributors that added all the features and fixes in this release. Questions or suggestions? Comment here or shoot feedback to @FirefoxDevTools on Twitter or our brand new feedback channel for Firefox Developer Tools. If you’d like to help out, check out the guide to getting involved. Didn’t Chrome have this for years? Years? Nah. Chrome implemented it just a little bit ago (March 2013). Firefox DevTools are moving really fast; it’s so awesome. Thanks Paul – much appreciated! the family that plays together stays together, go Goog and Moz! I think it is still far behind Chrome Devtools in stable and canary. None of these features are new and would tempt me to migrate to Firefox professionally. I am not trolling but even though I like Firefox and idea of Mozilla’s Open Web these things always stop me from using Firefox full time. Please guys fix this and make it at par or even better than Chrome Devtools! What are those things that stop you? Feel free to add your thoughts/ideas to our feedback channel for Developer Tools. You might not be trolling, but you aren’t giving any constructive, actionable feedback. Specifics please! Unfortunately Chrome’s debugger is significantly slower than others, sometimes taking 10 seconds or more to even switch tabs. Also why did they set it so the status-bar obscures the devtools tabs? Firefox’s definitely has a better design. Please give us the eyedropper as a native API. I beg you guys to wade through the security issues and give us the API. It’s crucial for creative web-apps! Can you please add that as an idea at the feedback channel for Developer Tools? We used the drawWindow API for this: https://developer.mozilla.org/en-US/docs/Web/API/CanvasRenderingContext2D#drawWindow%28%29. It is currently only available to browser code, but I agree that it would be very useful for design apps. There is a library (https://github.com/niklasvh/html2canvas) that emulates this behavior as best as possible, but as you can imagine this is very hard for user-code to get right and it will never be 100% accurate. Still, you could give it a try and see if it works for your case. I think the most important thing to note is the Quake 3 tab in that video. I really want to switch from chrome but when I have errors in my underscore templates chrome gives accurate line numbers in console but firefox does not. I can give an example if needed. I like the direction you are taking this guys, sublime editing is a big winner in my book. keep it up! Sublime style editing is crucial. Much appreciated. Firefox is looking more and more enticing as a development alternative to Chrome. Yes! This is a big one, very nice work guys! Glad you like it! None that I know of, off the top of my head, but we’re working on constantly progressing with nifty things like this. Could you guys look into fixing something that’s been bothering me for months? I constantly hit cmd+R while the dev tools are open when I’m looking at a DOM element or something that I’ve changed in my text editor. I expect cmd+R to reload the page (preferably without cache, as it’s an intentional reload). In Chrome/Webkit this works great, in Firefox it never has. Just one of those little UI issues I’d love to see fixed. Thanks for all the great work so far. That’s all great, but still no improvements with user agent spoofing for mobile devices? Glad you like it. Do you mean spoofing from the Developer Tools (as mentioned here) or a setting in mobile Firefox? Firefox has really started to hit a solid stride in this area, I’m really proud of how far they’ve come since they’ve introduced their own version of DevTools. There is a lot of polish in FF 29 and will be doing more testing with FF. 2 thumbs up to FF and Mozilla. but whenever i’m trying to use this box i saw a error that shows : install java script / or update it. now what i do? – I stayed as long as I could with FF until sourcemaps and sass support in Chrome pulled me over. SO, unless i’ve missed something, it’s just sad taht Moz hasn’t implimented sourcemap / SASS support – tragic. Even as a chrome user, I find too many devs are fairly meanspirited to Moz – considering that FF has been the IE monopoly breaker that got webstandards happening across the board. At the very least dev tools in general need a bit of healthy competition, and it seems that Good and Mox get that. Thanks for your comment. We do have that support, read more in Live Editing Sass and Less in the Firefox Developer Tools. Wouldn’t it make sense to be able to also change the box size size from within the Box Model Widget (as Chrome does)? These sublime key bindings are AWESOME! Keep up the good work guys! Looks great! But i really want a “Console” functionality in Add-on debugger. For instance in Google Chrome it’s possible to setup a breakpoint and then execute some code in context of this breakpoint. I want the same in FF. That’s really helps in debugging and allow to easily change addon state manually in certain points of code for quick testing. So resulting that’s some kind of Scrachpad + Debugger. Btw, is it possible that this is already possible and i just miss something? Love the progress on this! Any word on preventing the full page blue flash on page load (highlights body tag)? It gets crazy annoying when you keep the dev tools open all day. move one pixel at a time with arrow keys – drool!